I am good at wearing masks and tell myself that they are not just for my pride sake but necessary to function socially in a healthy fashion. I have been waiting for a place to be real, some women to be real with and I knew that was a God given desire and longing. I have had those types of connections in the past and I am thankful and optimistic about getting to know more sisters now and into the future. Transparency is key though and that doesn’t come naturally. Tonight as I opened up about something I have been struggling with for years I felt initially scared, it has been such a precious secret of mine. I realise, almost as soon as I opened my mouth to share, it hasn’t be necessary to hold it in so tightly. They prayed over me and I am so thankful. My Little Woman sat behind me on the couch as they laid hands on me and she mumbled in prayer and drove her hot wheel truck up and down my back… a moment of beautiful humor in the middle of a blessed and personal experience. Secrets are only serious and big as long as they are keep secrets, friends are only so distant until you open up and let them through the door to your heart, life is only so hard when you think you are the ONLY ONE! and I am thanking Jesus for honesty and unity among sisters tonight! It isn’t as serious as it sounds… hospital stay always sounds serious… I am pretty sure this is my first stay at a hospital for one of my kids (other then birthing) and that is pretty good considering I have been doing the mom thing for eight years. Baby Boy and I have been at the hospital for the majority of two days. Took him in for a doctor check up because his breathing wasn’t sounding great and the doctor sent us to the hospital because it seemed like asthma. The first trip up we where sent home after treatment because he was doing better and they couldn’t say for sure he had asthma. A few hours later we where back up because he was worse. This time he was admitted to the hospital due to labored breathing issues and we spent the day there so he could be observed. They treated him for asthma (puffers and the mask) and that was all he needed, after a few doses of medicine he started to do a lot better. We are now home and he is back to his normal self, eating, sleeping well and playing up a storm. The whole experience was harder due to no sleep for 48 hours and the effort it took to keep him happy being stuck to a crib all day. He was so bored! Making sure the other three kids where taken care of was a real concern too. Since I am nursing still I had to stay with Baby Boy almost the whole time. I am so thankful for the family and friends who stepped up to help us out with prayers and assistance! Turns out he probably had an aggressive virus (just a cold) and it ware him down enough that he was struggling to breath and beet the bug off. He has caught bronchial infections (viral) almost monthly since he was born so I figured eventually one might be bad. 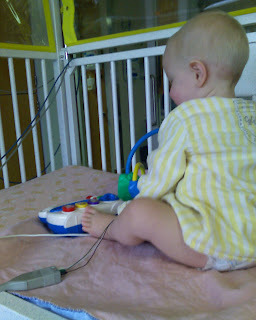 No asthma diagnosis as he is too little for the breathing test. Between him and his oldest sister I look forward to having them officially tested in the future so we can say for sure one way or the other as far as asthma goes. We are really thankful to be home. Sleeping in our own beds last night was wonderful! All summer I have been working at finding quiet time to go through a message series called ‘Soul Sisters’. Today I listened to the final message in a series. A parenting lesson rang out in this message. It was a lesson in how we speak to our kids. How we convince them to do what is right. We often get into the habit of convincing them to do right by reminding them of the self consequences or benefits to self and in the process aid in the development of a selfish world view. Instead, if we truly desire them to be empathetic and aware of others around them we should seize each little opportunity to start speaking in a selfless fashion. How often have I told my kids ‘don’t do that!’ and the why not is a consequence unto themselves? I strongly desire my kids to think of others and this gave me another example of how to improve my parenting skills in this area. The day my daughter came home and shared with me about her kindness to a bully I was surprised at her wisdom and reminded that children, in their innocence, can understand moral behaviour better then we do. “There was a mean boy bugging my brother today. I got in his face and told him to stop… and then I remembered he might be like that because no one plays with him so I asked him to come play on the monkey bars with me and we played all lunch hour.” She didn’t just react in justified anger but went a step further and empathised with him, even though he was in the wrong. I pray the Lord continues to bless her and me with such understanding. Check it out! It introduces an interesting interpretation of the ‘PROVERBS 31 WOMAN’ too. I am so tired tonight but this is bouncing around in my head so I want to put it down, to take a rest from the pondering, and come back to it. Wait on the Lord for the knowledge of His will and then once you know it you will know what to ask and you can believe His promises. Wow. Okay, if he is gonna basically tell us, if we will come to Him and wait on Him, then it makes the whole mustard seed statement about faith simple. It isn’t some mystery Christ is speaking. He really means that is all the faith we need! The faith is in God, believing God will do what he said he would do. How many times have I felt God was going to do something but been like this ‘I have know idea how you can make this work God…’ but in obedience, if I pray for it to be or take the step that I am required to do, then that is enough faith! That is the mustard seed! The mustard seed only becomes mystical when we try to work it into our agenda… we rush on with OUR plans and pray for God to bless what WE are doing… That is not the mustard seed. Though it might be impossible for ME and YOU, nothing is impossible with God! Comments welcome, as assistance in the pondering. Cereal must be on my brain lately! I bought a box of ‘fruity o’s‘ yesterday and I NEVER buy sweet cereal for the kids. I looked at it on the shelf and was brought back to my grandmother’s kitchen in the morning. She always had ‘fruity o’s‘ and I loved that about having breakfast with her; my mother didn’t buy the junkier cereals either. I grabbed the box off the shelf and thought about my grandma all the way to the check out and then all the way home. It brought to mind all kinds of sweet memories. I am thankful for the memories and not so happy at the idea of filling my kids up with sugar first thing in the morning but I figure I will hand out a handle full of the overly sweet o’s as snacks now and then, since I payed for them. I am thankful for the now and the growing ease I have to use the moments to reflect and just enjoy life. I kind of think everyone would have moments of joyful memory brought on by the little things around us if we made more time to BE. What could be more lovely for a sleep deprived mommy then to get to crawl back into bed? What would be more soothing to a weary teary soul then some snuggle time with a piece of my heart (Little Woman). The morning was gray, I awoke with the regular headache, and the snowy weather had me craving comfy… In spite of my desire to bury my head in the blankets, my body got going. The oldest two have a bus to catch and the husband needs a woman’s assistance in the morning (I wish for his sake that woman had been friendlier). Made sure the oldest two had all they needed and rushed them out the door with a hug, a wave and a prayer. Had a quiet breakfast of porridge and tea, kissed my husband good bye for the day… and the younger two where still sleeping. My girls share a double bed, I seized the day and jumped in to snuggle with my three year old once the house was quiet again. I watched her sleep, such perfect eye lashes and what a button nose. Listened to the quiet of a peaceful home, felt the stillness like a warm blanket and drifted into a nap. I knew I had to eventually get up and get things done, but the idea felt almost painful. I was immersed in the now and so in love with my beautiful daughter. Little Woman fluttered her eyes open and instantly popped out of bed like a Jack-in-the-box. Back to reality for mommy. I am sure she wondered why mommy’s voice chocked as we greeted one another ‘good day’; I was absolutely filled with thankfulness. This had been a sweet gift in time for me! It was just what I needed and I couldn’t help but give thankful praise to my Jesus as I poured Little Woman her porridge and cream. My morning felt like a firm wrap around hug from my father God to me… if only I was always so aware! I suppose I would be feeling like poor Piglet if I was out and about today. Thankfully I decided to stay home today and I am comfy. It is always a strangely lovely feeling to settle in on a blustery snowy day and just watch it snow, instead of experience it snow. There is lots to watch. About a dozen teeny tiny birds are running about on my lawn and they are as cute as a button! There is steam rising from my cup of creamy tea and if I watch it long enough I shall be mesmerized into a nap. There is Winny The Pooh playing on our TV and I never get tired of reading or watching Pooh Bear. There are two little ones puttering around. Baby Boy is full of chatter today and Little Woman is full of smiles. I barely have to look her way to get one! I have very big plans for my afternoon and those plans are to sit and watch, to sip tea and snuggle, all day! I like Tupperware and I love home made salad dressings. These two go together because if it wasn’t for Tupperware’s dressing mixer I wouldn’t of gotten into making them at home and they are soooo amazing. This item, linked below, makes it so easy! I want to share a favorite salad dressing of mine and hope there are others out there who make their own and can share a good one with me. I have a couple ‘Ranch’ recipes but I am not happy with them so if anyone has a great one let me know! Also hoping for a ‘Cesar’ recipe! MY SECRET WEAPON for making home made dressings! Blend the oil, vinegar, honey, dill weed, salt, onion powder, garlic powder, dry mustard and pepper. Blend until smooth, cover and refrigerate until chilled. You will need way more then this makes! Use your head with the spices and add what works for you! Taste it before serving it and add more spices if needed! I like more spices almost always! I had a rough night. Sleep deprived nights are not unknown to mothers. I struggle with them even more lately because I just don’t seem to have much strength. Every now and then Baby Boy wants to nurse all night and I just know I am going to wake up with a nursing hangover. I also woke up with a throat cold. I also woke up late and practically had a heart attack when I realized my kids where going to miss the bus! I stumbled out of my room with a yawn and a determination to light a fire under my family so we wouldn’t be that late and then I realised everyone else was on schedule. Dad had stepped in and everyone was dressed, feed, packing their school bags and, surprise of all surprises, had lunches made (by their Dad). My four little ones where happy and busy and all thanks to my man! I couldn’t believe it! He handed me my tea and encouraged me to eat a banana; both of which go a long way toward helping my nursing hangovers. A cloudy day, that looked like it was going to be out of control, instantly became a good day. There where a lot of bumps on the road this fine fall day but I somehow managed to not give up and that is thanks largely to the love and encouragement of my man! P.s. A nursing hangover is mostly dehydration due to nursing. Nursing strips your body of much needed omega fatty acids, resulting in a terrible headache. When you are pregnant your brain is also striped of these important fats and at that time in your life it results in what we call ‘baby brain’. Besides help and love, water and a smoothie with udo’s oil (has omega fatty acids 3, 6, and 9 in it) is an excellent cure for the nursing hangover.